Matt Might’s guide to what a Ph.D. is has travelled further than most sociology and philosophy of science ever will. So as clever as the illustrations are, forgive me if I quibble a bit with his argument. Might implies that what is taught and learned in elementary, secondary and to some extent in a Bachelor’s program is the core of knowledge. For literacy and numeracy that is undoubtedly correct, but I am not confident that the rest of the curriculum (which, after all, varies greatly by jurisdiction and even by the predilections of individual teachers) always captures the core of available knowledge. But I object more to his depiction of a Ph.D. and beyond. He pictures a Ph.D. not only as a small bump beyond what is known, but as a narrow one. That is not always the case. In some cases it could be smaller in depth, but broader in width – a thin line of somewhat greater length along the perimeter of the circle – perhaps even line segments at several different places on the perimeter with other bars drawn through the area of the circle connecting them. In short, while it can be, we know that extreme specialization is not always the best route to making an original contribution to knowledge. That is particularly the case when dealing with applied problems where inter, trans or cross-disciplinary research is virtually a necessity. I did my Ph.D. in Sociology comparing theories of change in biology, psychology and the sociocultural sciences with an interdisciplinary committee including a biologist, a psychologist, several sociologists and a philosopher of science. I have continued on that track throughout my career publishing in a variety of life, social science and science studies journals as well as writing an interdisciplinary monograph. I won’t pretend it is always easy, but it clearly is possible. 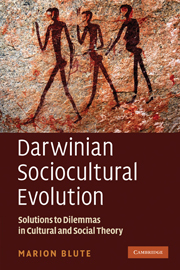 The most central theme in my research has been that sociocultural change occurs by processes essentially analogous to those of biological evolution. Alternatively, as some would put it, both are instances of the general class of selection processes (which includes as well as several other processes taking place within individuals such as learning by reinforcement and punishment and the adaptive immune response). So I will use my expertise to make the basic point that what is most adaptive to do depends upon the circumstances and one’s own condition. What is particularly relevant here is that selection can be scale-dependent. In a small scale environment with resources spatio-temporally or otherwise concentrated, it pays to be a fast specialist. But if resources are more spatio-temporally or otherwise dispersed, it pays to be a longer, slower generalist. You can pick more fruit from each tree, or alternatively less from each but from more trees. What is best to do all depends on the existing state of the world and our knowledge of it as well as one’s own predispositions, however acquired. Beyond the Ph.D., Might depicts one’s view of the world as a black outer ring, implying not only that one appreciates how much ignorance remains, but that one appreciates its breadth. Given the kind of Ph.D. he depicts, that is most unlikely. In that case, the most that one is likely to be able to appreciate, is the narrow black spot immediately beyond one’s own narrow corner. Tagged with Matt Might, Ph.D.